Lotus has been given a 10-week breathing space in insolvency proceedings brought by Revenue and Customs (HMRC). The High Court granted an adjournment after hearing a loan agreement had been finalised which meant that HMRC would receive £2.7m. the Formula 1 team, based in Enstone, Oxfordshire, is facing administration over a £900,000 unpaid tax bill. Mr Justice Birss heard a payment to HMRC would be made later this week. 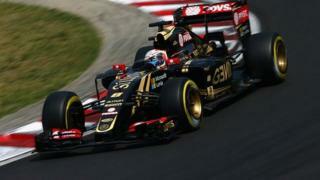 It comes as Renault has signed a letter of intent to buy a controlling stake in Lotus to create a new Formula 1 team for 2016. In a statement on Monday, Renault said it was the "first step towards the project of a Renault Formula 1 team". HMRC brought the case againts Lotus because of unpaid income tax and National Insurance for June 2015. Since then, while negotiations continued to save the team, a similar debt had accrued for July with another due shortly for August. At a hearing on 18 September, Lotus argued if an administration order was made immediately the company would cease to trade and it would cost 400 jobs.